The island has only 32 waterfront homes arranged around the 18-hole Indian Creek Country Club Golf course. 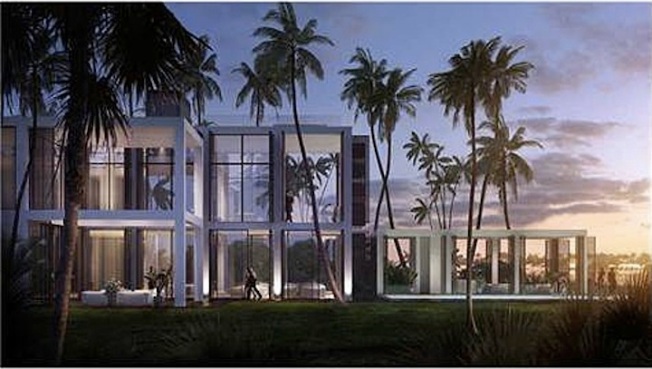 An unfinished home in Indian Creek Village, Florida, has listed for $40 million, reports the Wall Street Journal. The home is slated to begin construction in January and completed in 2015. The home features 20,304 square feet of living space on a 1.4 acre lot. There will be eight bedrooms, ten bathrooms, two pools, a bar and game room, and a spa with a massage room. Designed by Chad Oppenheim, the home is located on "the safest and most exclusive island in the world," states the listing. The island has only 32 waterfront homes arranged around the 18-hole Indian Creek Country Club Golf course.